Casa Mila, also called La Pedrera (Quarry House), was in the final stages of Modernism and at the height of Gaudí's career. 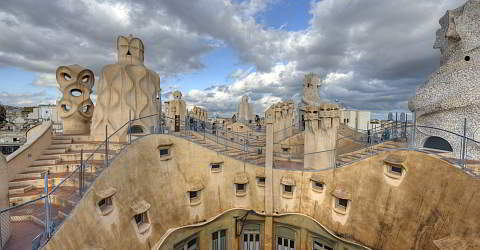 It is the best known and most innovative of the residential buildings and art works that Antoni Gaudí built before dedicating himself exclusively to the construction of the Sagrada Familia. Gaudí is the architectural pioneer: his unique ventilation system makes air conditioning unnecessary. The ventilation towers can be admired as works of art on the roof of the house. You remain flexible: Our vouchers are valid throughout the calendar year for a single admission.